When I was 16, growing up in Long Beach, California, I’d drive – not walk – two very short blocks to pick up a gallon of milk or cuppa joe in a disposable cup. When my friends and I wanted to shop, we drove to a mall on a traffic-jammed freeway to buy clothes made in China from fluorescent-lit chain stores. I ate bagel dogs from CostCo and fried chicken from KFC. Nowadays….my life in the LBC is a little different. My daughter and I commute everywhere via bike and foot and don’t own a car. We shop locally, eat healthfully, use reusable food and beverage containers, buy most of our clothes second-hand and have everything we need within biking distance. And it’s so much more fun. None of this impresses my Greek grandparents. In the “old country,” living this way wasn’t a choice but a necessity. Just as they smiled at me when I tried to teach them about ‘the three R’s’ (after all, they explained, they’ve been practicing ‘reduce, reuse, recycle’ for decades), I was surprised when a colleague claimed green building was “invented” in the 1970’s. We’re so disconnected from our earth – our home – we forget the very first dwellings were as green as buildings can be: made solely out of materials from the earth and designed strategically with sun and wind in mind (fancy words for “HVAC”). Aside from the immigrant necessity to live lightly, this is just common sense and economic, my Republican grandparents asserted. Why throw something away you can reuse? Why pay money to drive to buy toxic-sprayed produce when you can grow your own organic and better tasting fruits and veggies at home, for free? Why drive to work and pay for a gym membership when you can bike to work and save time and money and enjoy fresh air along the way? My grandpa biked eight miles to work for years and loved it. These ideas are far from new. Indeed, what’s old is new again. Green building, bicycle commuting and farmers markets are refreshingly old. That is why those of us seeking to live lightly on our earth must approach sustainable living with humility. What can we learn from our elders? What can we learn from indigenous populations? What can the natural systems of insects, plants, and rainforests teach us about how to design cities? What were the old marketplace models that resulted in lively public squares, supported local farmers and resulted in a congenial populace? If our favorite cities we love to wax poetic about were designed before the invention of the automobile, why do we keep designing and living in cities that are the exact opposite of this? Contemporary economists, city planners and bureaucrats are finally starting to realize that these issues form an interdependent web. Renovating our cities – like Copenhagen did in the 1970’s – so that people can get to work, school and shopping errands car-free has a tremendously positive affect on our economy, our health, and our communities. And while some of these renovations require large up-front investments (such as new light rail), many of our economic and social woes can be solved by low-tech, inexpensive solutions – such as creating informal bike sharing programs, produce exchanges and parklets. Both are needed to set our cities up for economic success. Walking and biking is more cost efficient than driving a car – not just because of the direct expenses to car owners but because car infrastructure (including parking) is much more expensive to taxpayers than bicycle and pedestrian infrastructure. Walking and biking’s direct link to buying local helps keep wealth within the community since many small business owners live in town – in contrast to a corporation headquartered in another city. There is nothing new about the idea of walking down the street and supporting your local shop owner or bicycling your child to school. These ideas are very ‘main street’ and American as apple pie. They are fiscally conservative and efficient. So before you hop in that SUV to Walmart with your restless kindergartener in tow, consider instead the far-reaching effects that riding a tandem to your local store will have on your child, yourself and your city. For starter’s, your kid will love it – and joyful living is the most important ingredient to any successful community. Imagine if 10 of your friends did the same. This is how the change to localism happens: slowly, intentionally, and humbly. Old school. April Economides is the president of Green Octopus Consulting, which helps business districts realize triple bottom line success through old school ideas like bike-buy local programs and public space creation. 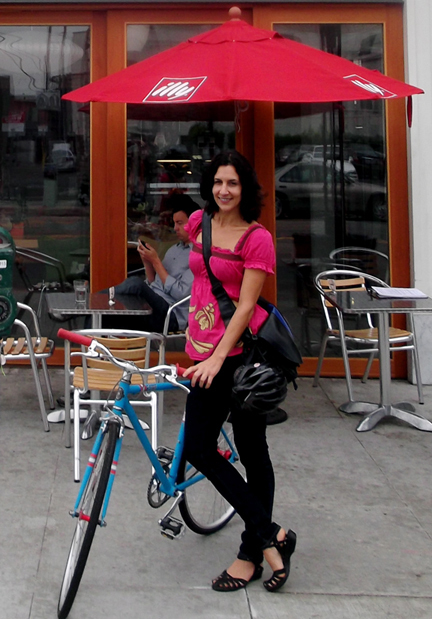 She manages the City of Long Beach’s Bike Saturdays and Bike-Friendly Business District programs.